Shine is the hero of light from the future, and son of Silver the Hedgehog and Amy Rose. With his Psychokinesis and superspeed, Shine fights alongside Fetalia the Dark to help keep the future safe. He always tries to do the right thing, but he sometimes likes to have some fun as well. Shine shows to have his parents good heart and willing to help others, but also their immaturity and stubbornness. He's shown to act like a little kid and pull out bad jokes and such, and his immaturity often gets him into trouble, which Fetalia has to get him out of all the time. Likes: Helping others out, being with Fetalia, fighting for good, having a fun time, laying loose, showing off, etc. Dislikes: Boredom, evil, buzzkills, losing, evil prevailing, rules, etc. Shine has never met his father, Silver, and has no idea who itr eally is. Most of his childhood was spent with his mother, where she helped him perfect his father's Psychokinesis and speed before she was killed. Shortly afterwards, he met Fetalia the Dark and the two help protect the future from dangerous evils. And they have Cosmo the Seedrian to help them whenever needed. 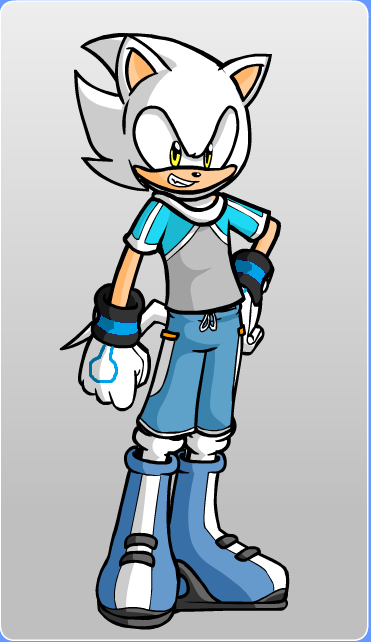 Shine is a white hedgehog with yellow eyes and light skin. He is semi-attractive. Shine wears a futuristic blue collared shirt, blue shorts, blue boots, and white glowing gloves that are like his father's. Shine has amazing Psychokinetic powers and amazing speed. I made this character in Furry Dollmaker on Deviantart. He is my SilvAmy lovechild. there is a typo: under "Sexual Description" you said "sues" instead of "uses"
thnx 4 picking that up, I didn't notice!